Next to the Raw Bar is Ocean Blue. It is a relatively small room but with windows looking out to the Waterfront promenade and with the forward end essentially open, the area does not feel confined. The light wood paneling and pale blue-gray carpets and furnishings punctuated by frosted glass give it an understated elegance. High-end Manhattan at sea. This atmosphere is carried forward by the staff. The servers do not wear the uniforms worn elsewhere on Breakaway but rather wear blue blazers and tan slacks. They do not carry trays of food. Instead, when a table is to be served, the servers are marshaled and each server will carry a plate to that table in a display of synchronized service. Each course is introduced verbally as it arrives. The object is to provide individualized but non-intrusive service; friendly but respectful. It was designed on land for time-conscious New Yorkers but has been adapted for the more leisurely world of cruising. Most of the guests dining at Ocean Blue dress casually. However, it is an elegant casual with even a few people in jackets. It is a relaxed but sophisticated evening. Although this is a seafood restaurant, it is not a “Catch of the Day” restaurant. Rather, it is a fine dining venue with dishes developed by Chef Zakarian that fuse a number of culinary styles. The menu envisions a “First Course,” a “Main Course” and dessert. The First Course offerings include “Crispy Calamari.” Calamari is a dish with wide appeal but its popularity has been hurt by flavorless, rubbery items that sometimes are passed off as calamari. At Ocean Blue, however, the calamari has personality. It is nicely breaded and the hot peppers and fresno chili aioli make it pleasantly spicy. For a less outspoken dish, try the Beet Salad. The squares of beets contrast nicely with the trout roe and rock shrimp; sweet and sour. If you prefer soup, the Carrot and Ginger Curry Bisque also offers contrasting flavors. However, before beginning, pause to take in the fragrance of the dish. You do not have to have fish for the main course, In addition to a grilled Delmonico steak, there is Roast Peking Duck. The duck is thickly sliced and is crusted with pistachios. As a result, you get a succession of flavors in each bite. For a light dessert, there is the Homemade Sorbets. These are thicker than typical sorbets and have strong flavors. To end the meal, Ocean Blue offers various teas selected by Chef Zackarian. Ocean Blue is more than an excellent meal, it is an experience. Norwegian Breakaway was conceived of as a New York ship. 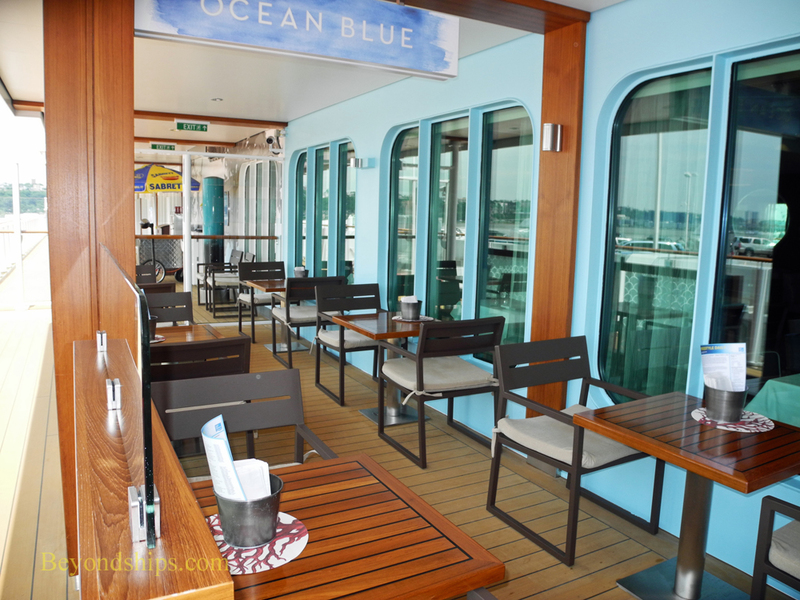 Ocean Blue brings the high-end sophisticated aspect of Manhattan life to the ship. It does this not by trying to imitate a New York restaurant but by having a New York chef and restauranteur create a New York style venue on the ship. It is real and it works. Outdoors on the Waterfront, Ocean Blue takes on a different persona. Here we are at the shore, sitting by the ocean just a few feet away. As you would expect, on a sunny day at sea or in port in Bermuda it works quite well. However, because the area where Ocean Blue is located is sheltered by a roof and glass wind breaks, it also worked on a day with 15 foot seas and occasional rain. Like walking along the shore on a cloudy day, it is an invigorating experience. The lunch menu outdoors is not as extensive as the indoor dinner menu but then this restaurant was not intended to be a multi-course fine dining experience. It is resort casual. Undoubtedly the star of the outdoor offerings is Chef Zackarian's take on the classic New England lobster roll. These feature large chunks of lobster still warm from cooking. Add to this a fresh, soft roll and a non-intrusive sauce and you have a tasty, up-scale lobster roll. The lobster rolls are supported by freshly-made thick potato chips that bear no relation to fossilized chips from a bag. There is a charge for each lobster roll but that does serve to keep you from eating them by the dozen. Copies of the ship's daily program (Freestyle Daily) are left on each table in case you want to see what is happening around the ship. Perhaps this is a subtle hint not to spend the entire afternoon sipping wine (available here by the glass), eating lobster rolls and looking out to sea. However, no one will blame you if you do the natural thing and opt to ignore such hints.